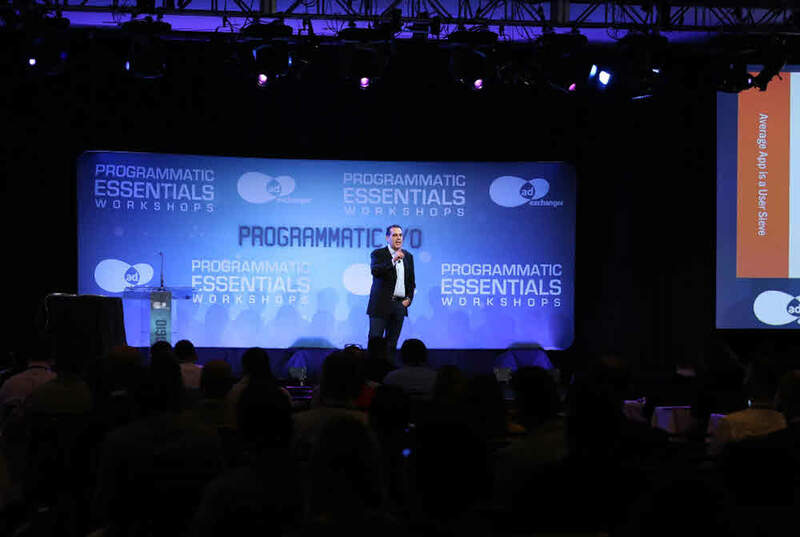 This week I had a fantastic opportunity to speak to the audience at Ad Exchanger’s Programmatic I/O SF about how app brands can use their first-party data to power extraordinary growth through mobile programmatic media. 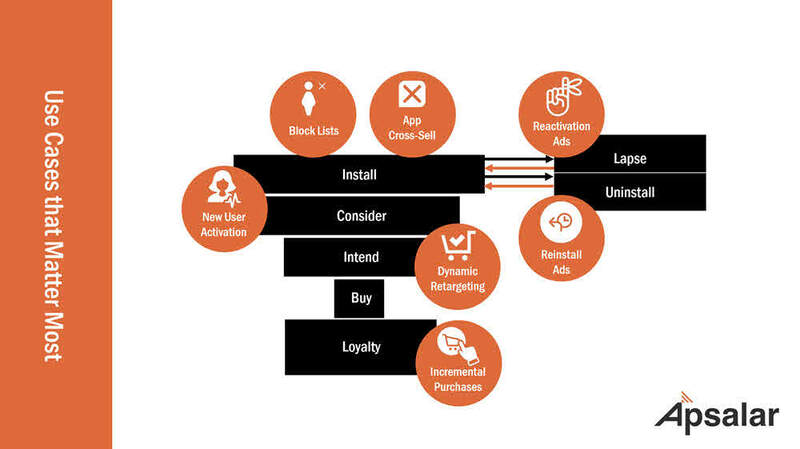 Mobile programmatic advertising is transforming the app industry because it affords marketers the opportunity to deliver customized ad streams based on those users’ past behaviors. 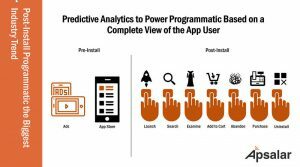 Using predictive analytics, advertisers can shape the marketing communications to each user, for more effective UA and re-engagement. At Apsalar we do a great deal of in-depth analysis on this digital advertising topic. We’ve been key pioneers in audience based mobile programmatic media. In 2016, we launched the Apsalar Mobile Marketing Cloud, which provides the data and intelligence layer that is essential for more efficient mobile app ad spending programs. Attribution Measurement: Premium attribution that measures the effectiveness of Android and iOS app marketing across partners, campaigns and creatives, and tracks all user actions in rich, first-party profiles. Our platform precisely measures and attributes credit for all mobile ads in support of app installs and re-engagements, including native ads, mobile video ads, mobile display ads, and more. Business and User Analytics: A robust set of category-leading iOS and Android analytics tools enable both long-term business analysis and the uncovering insights into the behaviors of high-value Android and iOS app users. Audience Distribution: A powerful synchronization engine to securely share audiences with mobile marketing partners for targeted efforts while protecting client businesses from costly data leakage. I’ll share some results data later in the post – in the meantime, suffice it to say that we have lots of knowledge on this topic. A few years ago, segmentation and custom audiences were the farthest things from many app marketers’ minds. That’s because the roots of the app category are in gaming, and game marketing used to be focused more around hype rather than traditional or “tradigital” marketing principles. In those days, app marketing was all about creating a frenzy of hype on the first days of an app launch, which drove the new app into the all-important app rankings charts (Android, iOS) of the App Store and Google Play. Rankings and top app lists were crucial to driving trial, which in turn drove rankings and more hype. 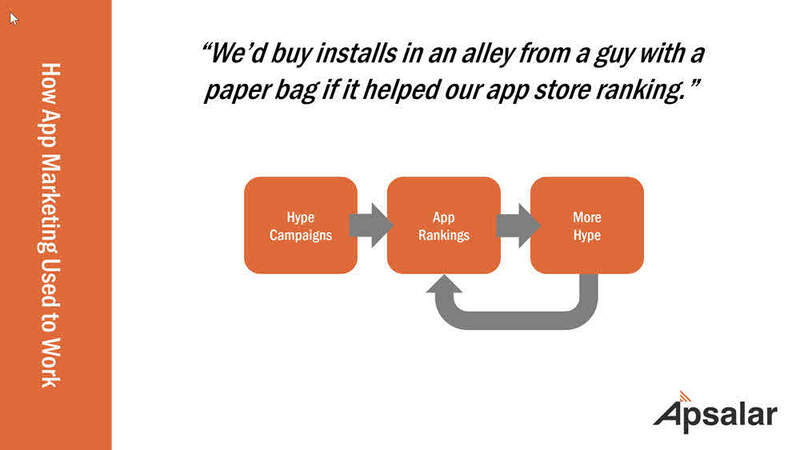 Funny story to give you a sense of how prevalent was this thinking: an app marketer for a financial services app once told our team, “We’d buy installs in an alley from a guy with a paper bag if it helped our app store ranking.” That gives you a sense of how hype-driven the market was, and how low on the priorities list were measures of user quality. As we all know, the app market mushroomed at an incredible pace. 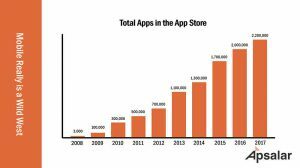 The chart below shows you the total number of apps in the Apple App Store by year. 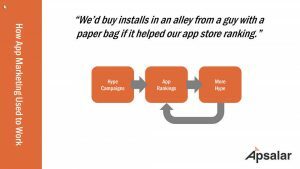 Those figures effectively put an end to relying on app ranking charts – there are simply too many apps to make entering the charts realistic for most new apps. 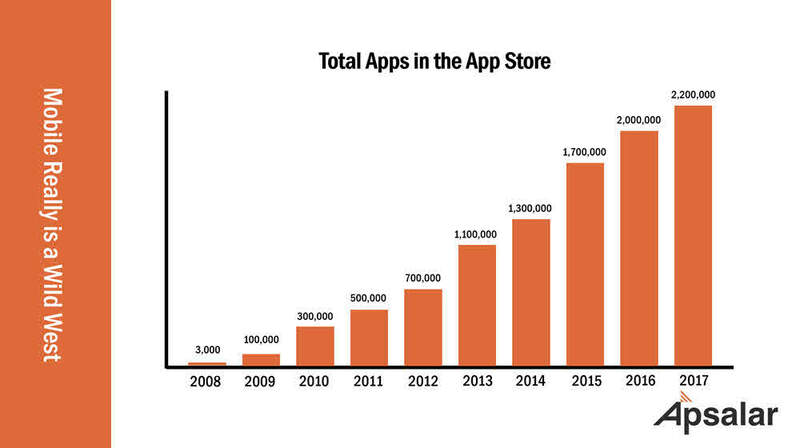 And for apps outside the gaming sector, the likelihood of making the charts is even more remote. 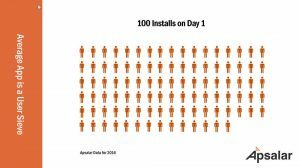 Imagine that you paid to acquire 100 app users today – that is, you drove 100 paid installs on Android or iOS mobile devices with paid advertising. 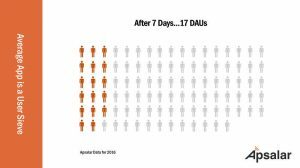 In just seven days, you will have lost 83 daily active users (DAUs). After 30 days, the figure grows to 90 lost DAUs. 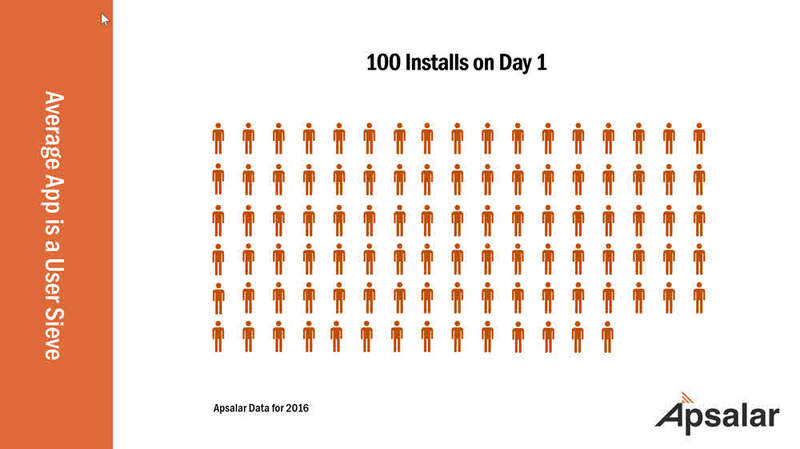 And 90 days after the install, you have lost 95 of those DAUs. Remember, these are people you paid to acquire! And 95 out of a hundred of them will be gone by next quarter! DAU is a high standard for mobile engagement. In the above hypothetical scenario, if you used a measure like Weekly Average Users (WAUs), your number of retained users would be a little higher. But whatever standard you use, there is no doubt that most apps and app marketing teams need to keep more of the users they work so hard to acquire. 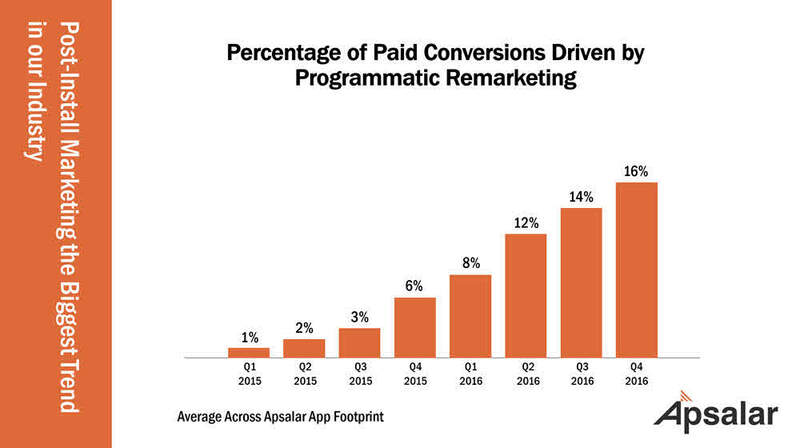 Revenue is now the key KPI by which app marketers get measured. 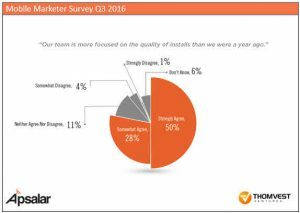 Year ago, many marketers were rewarded based on driving enormous install counts, but that’s no longer the case. 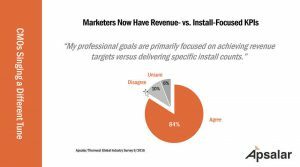 In a recent global survey of enterprise mobile app marketers, 84% of respondents said that their goals are now primarily focused on revenue. 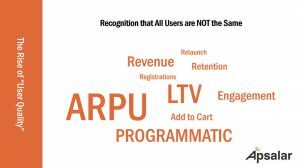 When we speak to advertisers now, the focus is more about revenue and ARPU than vanity stats like total installs. The drive for incremental revenue has suddenly made mobile programmatic the star tactic of 2017. 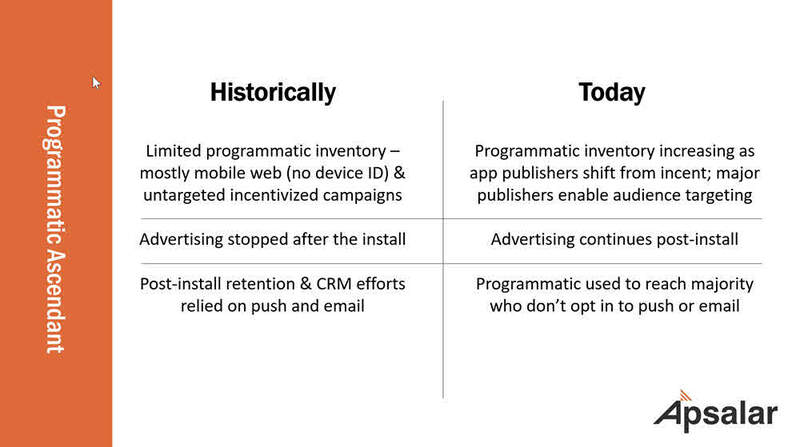 Historically, limited programmatic inventory was available from ad networks. Many focused on mobile web inventory (which cannot be tracked using device advertising IDs) and incentivized install campaigns. 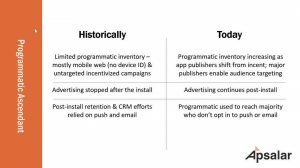 Today, the amount and quality of programmatic in-app advertising inventory has mushroomed as publishers move away from incentivized and toward helping marketers drive quality users through one-to-one, audience-based marketing. 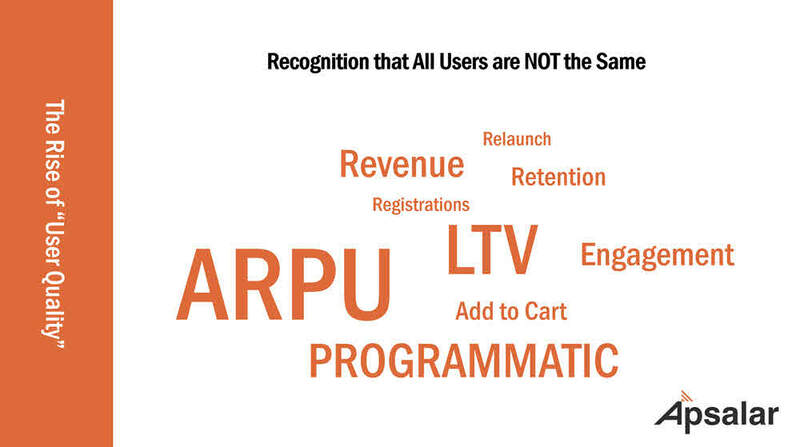 “User quality” is about monetization, long-term relationships, and making multiple purchases. We’ve discussed this phenomenon in other blog posts. 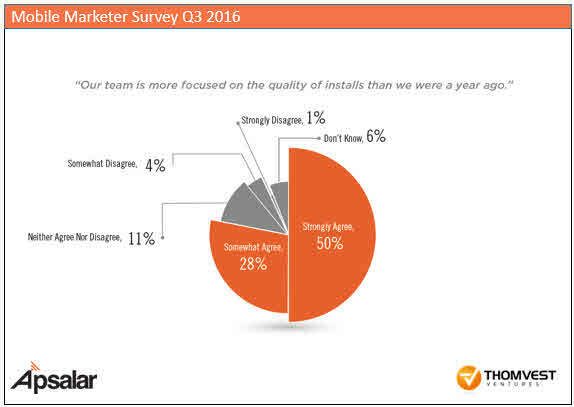 But to recap some data from our recent app industry survey, 78% of marketers say that they and their teams care more about user quality than they did a year ago. Measuring user quality – with revenue, ARPU, retention rates, uninstall rates, and the like – is all well and good, but app marketers want to do more than just calculate the current state of their businesses. They want ways to improve that state. That’s where predictive analytics come in. Most app marketers are anxious to unlock the value of their first-party marketing and user data to improve user quality, revenue and profitability. 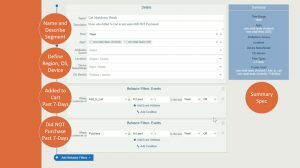 Apsalar is uniquely positioned to meet that need because we have visibility into both our customers’ marketing performance data and every action their users take inside apps. But collecting, standardizing and organizing all this information into a user store, we create the foundation for deep user understanding. Further, we can predict likely future actions with startling speed and accuracy. Which app users are in danger of uninstalling? Who among your app users appears to be considering a big purchase? 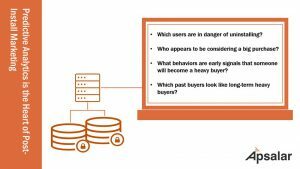 What behaviors are early signals that someone will become a heavy buyer? 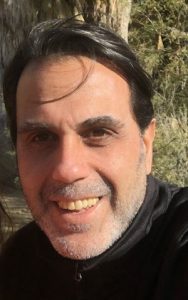 Which past customers look like they could become long-term heavy buyers? Which usually buy each month but haven’t this month? Which buyers haven’t launched in the past 30 days? 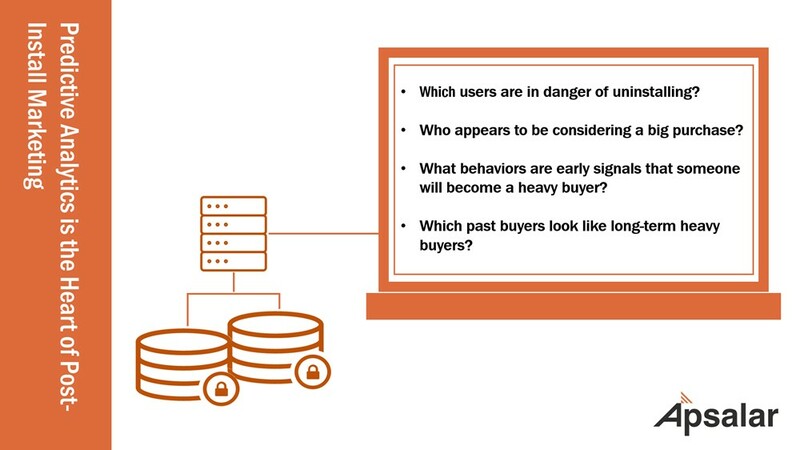 By analyzing EVERY action taken by a user with their device — from ad app launches, product searches, add to carts, transactions, and even uninstalls/reinstalls, we develop a user store of data and apply predictive analytics to anticipate future actions. Block Lists: Creating a list of mobile device IDs for the current install base, and providing those to a media partner so that no UA dollars get wasted reaching people who already have an app. Using these IDS as a “block list,” the partner can ensure that those devices do not UA messages. App Cross-Sell: Building out a list of device advertising IDs of the users of one of a company’s apps. The marketer then shares those IDs with mobile programmatic media partners for cost-effective cross-sell of another app. Those partners then use their programmatic platforms to execute a mobile campaign via real-time bidding. 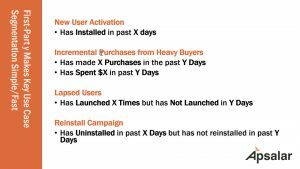 Reactivation Ads: Here the marketer creates a list of mobile device advertising IDs for users who have not launched the app in ‘N’ days. Using these as a target list, the programmatic media partner delivers ads designed to drive a relaunch, using real-time bidding. 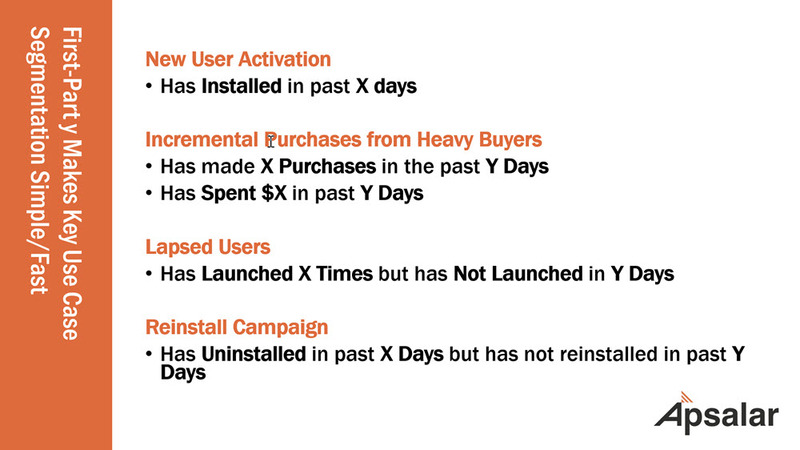 New User Activation: Similar to reactivation, except a bit more proactive. Here the brand provides a dynamic list of new install mobile device advertising IDs to their programmatic partner so that those devices can be targeted with ads to drive incremental launches in the critical first hours and days of a brand relationship. Some marketers choose to use ad networks to execute the mobile programmatic media buys, while others prefer demand-side platforms. Click-through rates and other performance measures for such campaigns are consistently very strong. Reinstall Ads: Here a marketer exports a list of IDs for recent uninstallers. Partners then use programmatic trading to deliver targeted messages to this audience, with creative designed to get them to reinstall the iOS or Android app. Dynamic Retargeting: Dynamic retargeting ads are now the lifeblood of PC and Mobile Web Internet. And thanks to mobile programmatic, they are now becoming increasingly important to “close” more in-app purchases. As in PC-based remarketing, such campaigns are usually delivered in programmatic display. Incremental Purchases: By exporting a list of frequent and/or high-value purchaser IDs, a brand can use any of its real-time bidding platforms or partners to deliver customized mobile ad messages designed to drive incremental in-app purchases. If this data-driven approach sounds a little complicated to execute, don’t despair. 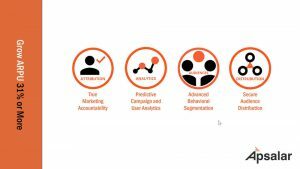 We offer a web-based tool designed to use relevant first party data sets to define target audiences for each of these use cases. 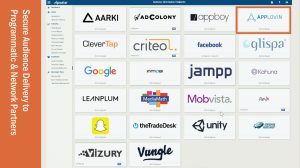 Using this tool, you can work with the partner of your choice to identify programmatic ad inventory that will reach and connect with your users. Let me show you some specific examples of how your unique first-party data points can enable these very powerful use cases, and then I’ll show you the results we see for these techniques. In the screenshot below, we’ve used a tool to define a dynamic audience of cart abandoners for mobile programmatic retargeting. Names and describes the type of segment that they are trying to create. Defines a region, OS, and set of devices to focus on for the ad buy, if desired. Creates the first criterion for inclusion in programmatic platform audience, in this case, that the user has added to a shopping cart in the past seven days. Creates the second criterion, in this case, that no purchase has been made in the past seven days. With just two first-party data points, the marketer has created a powerful dynamic audience for retargeting. Other use cases are often just as simple. Here are a few more examples of a use case and the one or two data points necessary for defining it in our toolset. Once the marketer has defined her audience, she can then decide which media partner(s) to share it with. 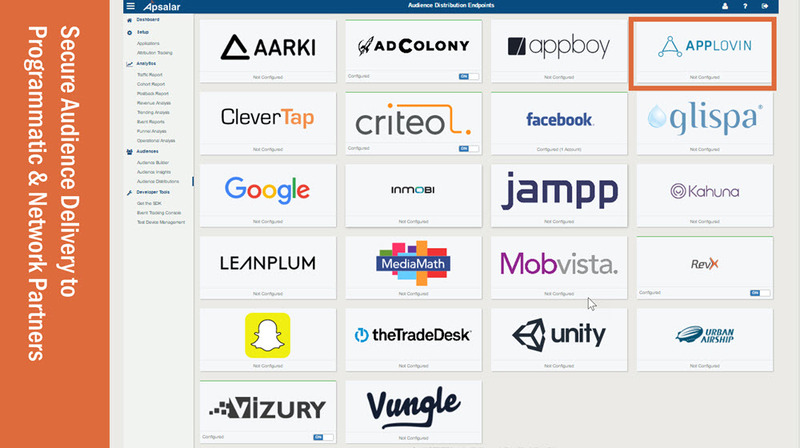 We’ve pre-built a variety of integrations for seamless one-click audience sharing. You just select the appropriate partner and choose the audiences and data to share. You can also send either a static or a dynamic audience. Now let’s take a few minutes to talk about the results marketers see from mobile programmatic marketing based on first-party in-app data. To provide the numbers and other findings outlined below, we used a sample of about 25 of our clients. Further, we use lift analysis and measurement to calculate the effects of the programmatic programs executed using first-party data. First, let’s look at the impact of mobile programmatic post-install ad campaigns on 7-day retention, meaning the number of people who have launched the app within seven days of a specific date in their app relationship. 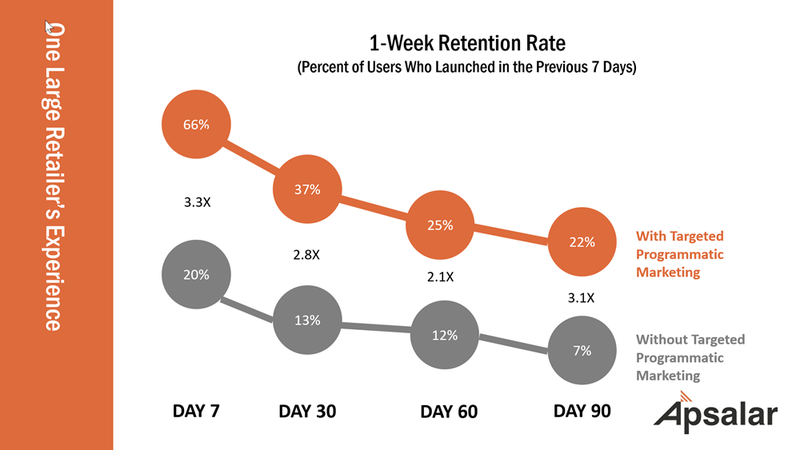 As we discussed earlier, user retention tends to be very low for apps, but our data show that proactive, programmatic marketing using first-party in-app data can improve results by 2-3X. That’s a massive difference for any marketer tasked with growing revenue. It means that they can have 2-3 times as many potential purchasers in their buying funnels. The data in the following slide reveal the impact for one major brick and mortar retailer, who gave us permission to share the data provided we did not mention their name. 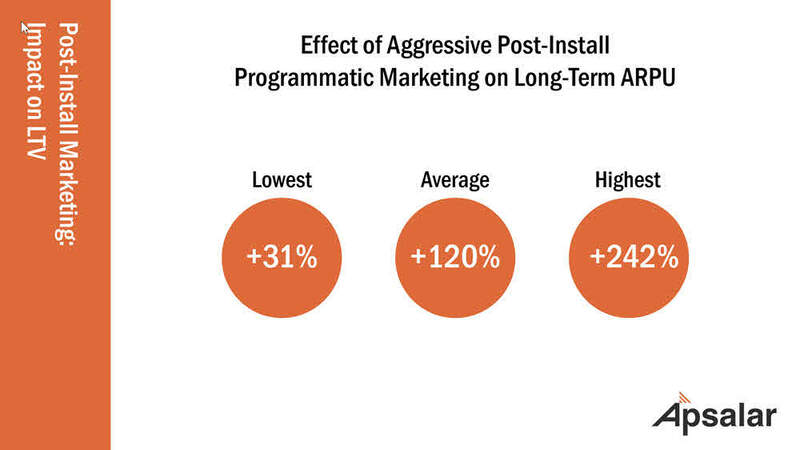 Our in-depth analysis on this business showed a very strong relationship between post-install ads — especially those with customized creative — and marketer success. In light of these impressive results, marketers are aggressively pursuing programmatic initiatives. 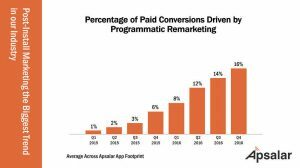 We’ve seen big increases in the share of paid conversions driven by programmatic, from about 1% just two years ago to more than 16% today. App marketing is changing dramatically. 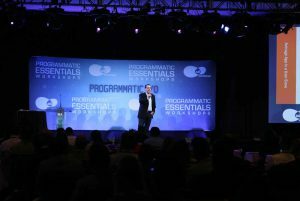 More marketers recognize both the growing supply of programmatic media and its transformative power. 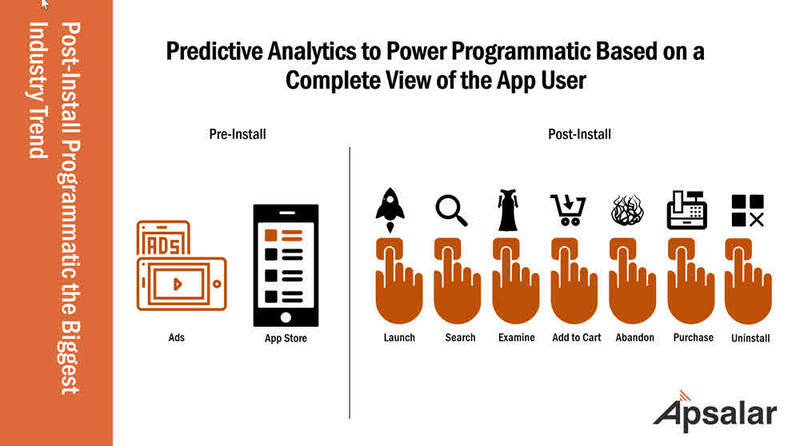 Mobile programmatic media, powered by first-party user data, is driving a transformation in app marketing. By applying a few simple use cases to your business, you can big drive revenue and profitability gains by spiking your ARPU. Thanks for reading. For a PDF copy of these slides, click here.